PT. Jakarta Propertindo (Jakpro) through its subsidiary, PT. 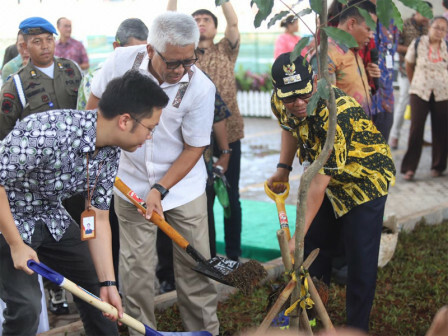 LRT Jakarta plants trees at Kelapa Gading LRT Depot at MCC Building, North Jakarta.
" PT. LRT has committed to green this five hectares depot area"
This tree planting activity is done in form of PT. LRT Jakarta's commitment in making LRT depot and lanes as green spaces (RTH). PT. Jakpro President Director, Dwi Wahyu conveyed, trees planting can reduce pollution and green the Kelapa Gading LRT Depot which has five hectares land. "PT. LRT has committed to green this five hectares depot area. It is a part of our social responsibility," he said, Thursday (1/10). Meanwhile, PT. LRT Jakarta President Director, Allan Tandiono added, this activity is one of LRT Jakarta's contributions in greening the City. "We will be active to take a part in preserving the environment continuously," he asserted. For information, there are 1,190 trees planted near LRT stations contain of 500 mahogany trees, 190 sapodilla trees, and 600 tropical almond trees.